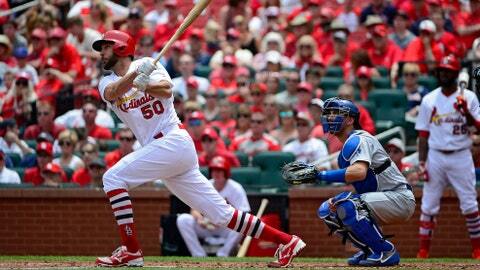 Adam Wainwright homers off Dodgers pitcher Brandon McCarthy in June. ST. LOUIS — Adam Wainwright has bragged about his hitting for years. Now he has the hardware to back up the boasts. The longtime Cardinals pitcher, 36, was honored Thursday with his first National League Silver Slugger Award, denoting mastery with the bat. One player is named at each position, and among NL pitchers, Waino was the choice. Wainwright batted .262 last season, getting 11 hits in 42 at-bats. He had two doubles and two homers among his 11 hits and drove in 11 runs. Bob Forsch (1980, 1987) and Jason Marquis (2005) are the only previous Cardinals pitchers to win a Silver Slugger Award.